Giants Head Caravan & Camping Park is situated near the ancient Dorset village of Cerne Abbas, recently described ‘Britain’s most desirable village’ to live in, in the UK. High above the steep hillside is the site of an ancient fertility symbol carved into the hillside, the 180 foot high figure of the world famous ‘Rude Man’, the Cerne Abbas Giant. Now famously known in China as - The Big White Streaker! The Park, about three and a half acres is kept as natural as possible with mature trees and hedgerows, well drained and has a good hard road with 50 grassy pitches for touring caravans, tents and motorvans, with terraces and wonderful views over the surrounding Dorset countryside. 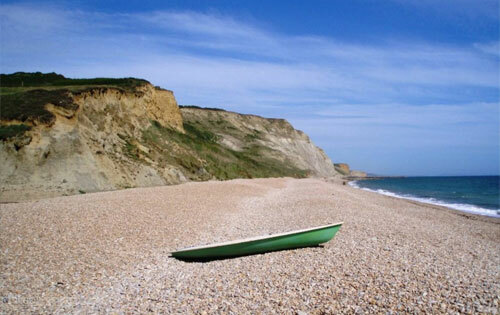 Right in the centre of Dorset in An Area of Outstanding Natural Beauty (AONB) giving great access to the very best of Dorset, including the Jurassic Coast along the East Devon and Dorset’s beautiful coastline, the Jurassic Coast is England's first natural World Heritage Site. On-site amenities include showers and hand basins plus washing up and laundry facilities, together with shaver points and hair dryer. Electric hook-up points, and battery charging is available on request plus the campsite is dog friendly with a separate area set aside for campers with dogs close to Wessex Ridgeway for some great walking. There is no shop on site but there are several great places to eat within a 5 mile radius including three pubs, a fantastic tea room and a well-stocked shop in the scenic village of Cerne Abbas just over a mile away, a further three pubs can be found along the Piddle Valley. Eight miles down the road is the County town of Dorchester, birthplace of Thomas Hardy, who spent most of his life in rural Dorset, which provided a background for his fiction including Far from the Madding Crowd, the new film released in 2015. There are several South West Coast Path walks available from Giants Head and Treasure Trails (Dorset, New Forest and South Devon) is run directly from the site so visitors can pick up any of the 100+ Treasure Trails and head off in search of Dorset's hidden secrets. The Trails are a great fun thing to do for all ages and at anytime of the year, but especially for a day out with the kids at the weekend or over the school holidays (although - there are no children necessary - as there is a big kid in all of us! ).